That’s the question that Farmville and Mafia Wars players all over the world are asking today. Why are they changing my Facebook, don’t they care about their customers. Well, here’s the problem, while Facebook needs users, users aren’t their customers. Advertisers are the customers and you, dear Facebook user, are simply part of the data stream that advertisers desperately seek. So, while some of the changes don’t seem to make sense to you or cause you to learn a new way to interact, they are aimed at one thing primarily – getting you to share more, so advertisers can personalize more – end of story. The recent moves on Facebook earlier this week and announced during their annual f8 conference are business friendly moves aimed at tapping more revenue generation from your sharing addiction. The Timeline – this is the most buzzed about change because it’s the most visual. Users will get a chance to totally redesign their profile page based on their total history, rather than the past few days worth of sharing. This is the first move towards pushing you to share more disguised as more control. Frankly, I don’t think this is that big of a deal because most content is actually consumed in the news feed, but this could be a more appealing way for a brand to present their story. New Custom Verbs – Like and Recommend are no longer enough – Facebook announced that brands will be able to introduce new custom verbs such as “cook” “watch”, “read”, “hike” and “listen.” Do Facebook users really need more ways to say what they are doing, perhaps not, but brands will likely see this as a creative way to get more engagement and build campaigns around sharing using specific verbs in conjunction with the nouns of the brand. Real-Time Direct Marketing – Facebook didn’t call it this but hidden away in several of the announcements yesterday were a couple things that marketers and developers are likely frothing over. 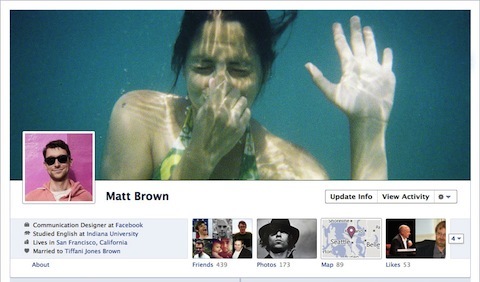 The Open Graph Beta is the expansion of how information is shared via apps with Facebook Users. The demonstration of this new expansion was the Spotify music integration. While many people saw this merely as a cool trick that allowed users to connect and listen to music with their friends it’s far more than that. Marketers and app makers may find very quickly that this is a fabulous way to push real time ads, with a high level of personalization into what is essentially branded entertainment. Apps must now gain Manage Pages permission. While this seems like more security, if pages grant this new permission they are effectively giving access to their Fan Pages and all the data that comes and goes, making it a real time marketing playground for targeted offers. Time will tell if Facebook users get tired of all this manipulation and change, but my guess is that they gave their users just enough candy to keep them happy while creating a path for the future of revenue generation inside the data.